It came to my understanding as an idea and now a hypothesis that the Arabian Peninsula and Punt Land came under very strong Turkic Mongolian settlements and slavery since 1600 BC and became well-established around 1000 BC. This was part of a very wide Turkic Mongolian raids and expansions. This transformation is what resulted, among other disasters, in the downfall and disappearance of ancient Arabs, Punt, and Kerma. It also led, with the involvement of Persians (who are also of Turkic Mongolian colonization of Iran) to the replacement of the genuine religious Law of Moses with a political Turkic Judaism in 530 BC. The initial settlements in the Red Sea region created Saba’a of Yemen (which is totally different and centuries later from Sheba of Punt Land) and also D’mt. These two Turkic regimes assisted in the formation of Kush in Kerma (ancient Nubia) and all of them were slavery and gold based businesses. The disintegration of Punt separated the Beja and formed secessionist identities which formed, with later Ottoman role, the present states. The introduction of horses as military weapon; FGM; homosexuality; face and body tattoos; and the symbols of Moon, Sun, bull head, and cross of Tengrism are among the most common features of Turkic Mongolian settlements and they could be used to identify them. First, indigenous sedentary people with at least three distinct ceramic traditions occupied central Tigray (Yeha I, Sefra Abun, Sefra Turkui and Aksum region), Agame and Akkele Guzay (Gulo Makeda, Sobea and Matara VIII–V) and Hamasien (‘Ancient Ona’), respectively, in the early first millennium BC. Cattle herders were also moving at the margins and across these regions at this time, and most likely contributed to the development in an exchange network among them, and between the communities on the highlands and those in the lowlands and coastal regions (see Finneran 2007: 92–8). The culture historical meaning of these three main ceramic traditions is still unknown. They might represent either three variants in pottery manufacture by the same people with a common subsistence economy and settlement pattern (and perhaps language) or three separate populations (see also Curtis 2009). 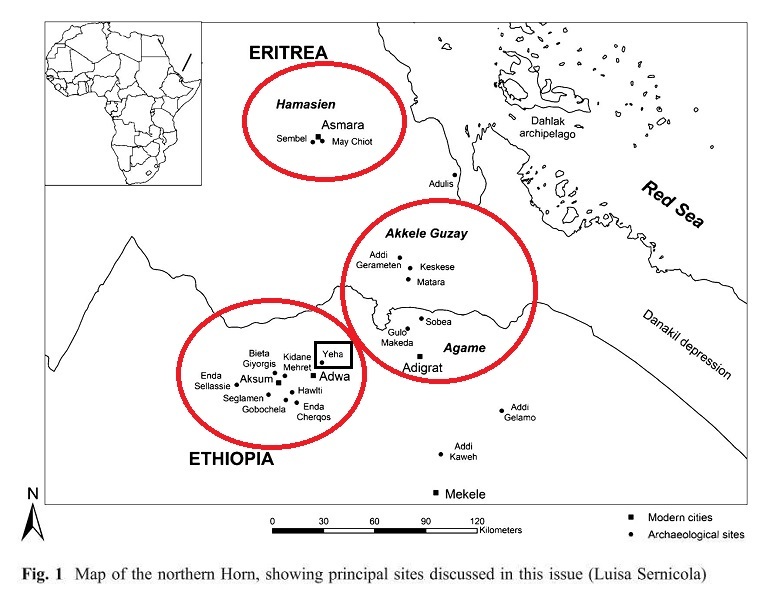 The ‘Ancient Ona Culture’ in the Greater Asmara region (Hamasien) might be ascribed to a separate population as this culture is characterised by some specific features, such as ritual stone bulls heads, which do not occur in the other regions (Schmidt 2009). Moreover, an alignment of six collapsed monoliths with roughly rectangular crosssections at Keskese might suggest that this was an important ceremonial centre in the early first millennium BC, and may point to the emergence of a hierarchical society in Akkele Guzay at this time. These monoliths are in neither a South Arabian nor Aksumite style and may thus be ascribed to a local tradition (see also Curtis and Habtemichael 2008: 321–3). The way the populations living in these three main regions interacted with each other is uncertain as well. At present, there is no sure evidence of any interaction between the populations living in Eritrea and Tigray in the early first millennium BC. A few fragments of red-orange coarse ware like that of Yeha I in central Tigray have been collected on the surface at Keskese in Akkele Guzay and might suggest some contacts between these regions (Fattovich 1980: 35), but this evidence is much too scarce to be conclusive. Red-orange coarse ware like that of central Tigray was also collected in sites of the lowlands near Kassala, and may suggest contacts between these regions in the early first millennium BC. within a more intense exchange network or movement of female potters in both directions as a consequence of marriages. Black-topped polished ware was a major component of the ceramics, suggesting a possible origin of this tradition in Akklele Guzay and Agame rather than in central Tigray, where red-orange ware most likely disappeared. to south and east of Asmara (Schmidt et al. 2008: Fig. 6.42; Leclant and Miquel 1959: Pl. LVIII; de Contenson 1963b: Pls. XLII b, LIII a; Anfray 1963a: Pls. CLII hk, CLIV e-h). Moreover, a few fragments of storage jars from Sembel (Tringali 1978: Fig. 24c), which are similar to those of the Jebel Mokram group in the western Eritrean-Sudanese lowlands, as well as fragments of Ona jars from sites near Agordat (Brandt et al. 2008), and Ona-like small stone and clay bulls’ heads from Sabir near Aden (Buffa and Vogt 2001: fig. 3.3) may suggest contacts both with the western lowlands in Eritrea and Sudan and with the coastal regions of Yemen. Finally on this point, the occurrence of different ceramics at Yeha III and the late ‘Pre-Aksumite’/early Aksumite (according to Anfray’s chronological sequence; Anfray 1967) occupation at Matara may suggest the re-emergence of two separate ceramic traditions in central Tigray and Akkele Guzay in the late first millennium BC. Second, so far, ceramics in a South Arabian style occur only in sites of central Tigray, Agame and Akkele Guzay, and form a minor (almost insignificant) component of the pottery assemblages at these sites (Fattovich 1980). These ceramics thus do not support the presence of any consistent South Arabian community on the Ethiopian/Eritrean highlands in the first millennium BC. Most of them may also be local imitations of South Arabian prototypes, such as bowls with a ring-foot and possibly the so-called ‘amphorae’ (see Phillipson 2009). In any case, these pots may suggest that both the people of central Tigray and those of Agame and Akkele Guzay had some contacts with the populations of southwestern Arabia beginning in the early first millennium BC. Ceramics in a South Arabian style occur in the earliest strata at Yeha (Yeha I), where they may be contemporary to the construction of a small temple probably in a South Arabian (Hadramawt?) style in the eighth century BC (Robin and de Maigret 1998; see also Manzo 2009). A few fragments of big jars similar in the style to those from Sabir (Aden) were collected in the lower strata at Matara (Anfray 1966; Fattovich 1980: 76, 84), and may point to contacts with the coastal regions of Yemen in the early first millennium BC. These contacts are also supported by rock inscriptions in the region of Qohaito recording the names of individuals (not ‘tribes’ or colonists) who penetrated from South Arabia into central Eritrea as early as the ninth or eighth centuries BC (Ricci 1994). So far, however, there is no archaeological evidence of their presence, suggesting they were completely amalgamated with the local population(s). Bowls with a ring-foot and the so-called ‘amphorae’, which were typical of Yeha I, also occur in the ceramic assemblages of Yeha II and Matara IV–III suggesting that they were incorporated into the common ceramic tradition of central Tigray, Agame and Akkele Guzay in the mid-first millennium BC, but represent an insignificant component of this tradition (Fattovich 1980: 51–52). Finally, these vessels completely disappear in the ceramic assemblages of Yeha III, suggesting they were no longer used in the late first millennium BC when a new (proto-Aksumite) ceramic tradition emerged in the region of Aksum (Fattovich 1990, 2004; Fattovich and Bard 2001). Third and last, at present, only the ceramics of Yeha II and Matara IV–III, ascribable to a common tradition of central Tigray, Agame and Akkele Guzay, can be safely associated with monuments, votive altars, offering tables and inscriptions in a South Arabian style (Fattovich 1990).5 All other sculptures, inscriptions and votive altars in a South Arabian style, which are usually dated to the mid-first millennium BC on a comparison with possible prototypes in Yemen, have been recorded out of context, and thus cannot provide any firm cultural or historical information. We can tentatively assume they were associated with a few ceremonial centres scattered from central and eastern Tigray to central Eritrea (Fattovich 1990, 2004), and were possibly contemporary with the sites with ceramics similar to those of Yeha II and Matara IV–III. These artefacts suggest that a powerful elite emerged in the highlands, most likely in the mid-first millennium BC, and adopted some South Arabian symbols as a manifestation of their power (Fattovich 1990; Curtis 2008; Manzo 2009). A few votive altars with inscriptions apparently recording individuals from Yemen (Saba) may suggest that some South Arabians, maybe traders or craftsmen, were living in Tigray as well (Schneider 2003: 613). An exhaustive synthesis of the cultural history and the social, economic and ideological transformations in the early- to mid-first millennium BC is still premature as most of the northern Horn of Africa is archaeologically unexplored and the collected evidence is mainly from surface surveys (see e.g., Fattovich 2005: 12–15; Curtis 2008). declined in the late first millennium BC (Yeha III).